HARRISBURG – To help loved ones better find if a life insurance policy was taken out by a deceased family member, Rep. Tina Pickett (R-Bradford/Sullivan/Susquehanna) took part in the announcement of a new state service to help track down the existence of policies at a press conference in Harrisburg on Oct. 25. Information on filing a life insurance policy finder request and the forms needed to do so are on the Insurance Department’s website, insurance.pa.gov, by clicking on “Life” under “Insurance Coverage Resources.” Individuals are notified when a policy is found if they are listed as a beneficiary on that policy, or otherwise entitled to that information. 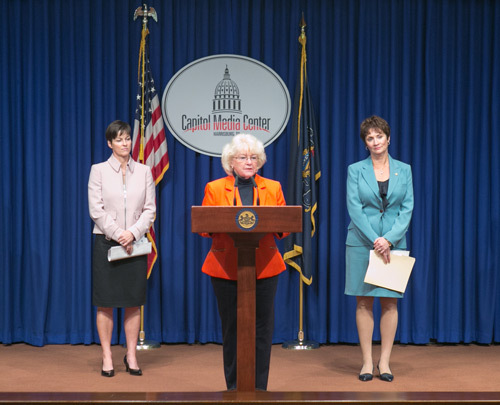 Rep. Tina Pickett, chairman of the House Insurance Committee, joined Insurance Commissioner Teresa Miller and Rep. Marguerite Quinn at an Oct. 26 press conference to announce a new state service to help loved ones track down a life insurance policy of a deceased family member.